The Mekar script font can be used to design websites or posters, which need some new & exuberant design ideas. The script has all the essential elements that are needed to make it more dynamic; The typeface Mekar font has cursive or handwriting style font. The letters connect with each other in these kinds of calligraphic fonts. The cursive style makes it more elegant and more natural. Mekar font is also quite effervescent. The font can be used by apparel brands and clothing lines, to promote their product. The lively font style makes it more attractive for the apparel brands. And the slightly outlandish font works well with new age users and young customers. Sport equipment makers and other sports websites or blogs can use the Mekar font because of its high- spirited design. There is also a number of sports equipment where the ads use these fonts. They are quite attractive and create an impression on the viewers hence the brand can have added advantage. The Mekar font style is legible or readable in any size; many cursive fonts tend to be illegible from a distance or when the size becomes too small. But the Mekar font has no such issues. It is a smooth and graceful font design, which has versatile usability. The curves and style only make these fonts highly popular in the field and due to their excellent style only they are used by experts in various sectors who deal with mass. Designers can get inspired to create such alluring & lively fonts. The font is available in TTF format, and it can be used to design logos, invitation cards, product labels, visiting cards, anniversary card, and other types of cards or posters. The Mekar font is totally compatible with Photoshop, and you can use it in your cards or designs. The font style can also work for personal websites and blogs, which need a personalized touch or font style to make it friendlier for users. The style of these fonts only has made them famous in different areas where one needs to display the creativity and attract the viewers. This type of interface uses elongated alphabets, which are also slightly inclined. And the different segments of the websites can implement different types of calligraphy in order to represent separate moods. With the utilization of blend of modern and classic calligraphy typeface like Mekar, the artwork will become much more captivating for the user. And this helps you to have a close relationship with the online visitor. The font can be edited or customized in Photoshop, and the font color, size can be altered to fit your design. The Mekar font design usually looks elegant and attractive when it’s larger than the accompanying text. 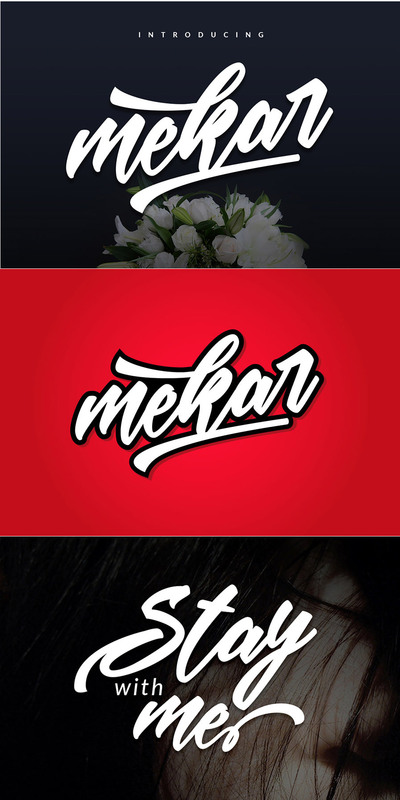 The need for calligraphic fonts, such as the Mekar script font has increased drastically as companies or businesses are trying to connect with users with unique font styles. For the market experts and those who love to use a variety of fonts for different uses these fonts are much useful and hence they are much popular in the field also.